Dr. Julia Gallo was helping the poor in Afghanistan until she was captured by Taliban leader Mullah Massoud and his sidekick, Russian intelligence officer, Sergei Simonov. The ransom demand is the return of the al-Qaeda terrorist Mustafa Khan who is currently in an Afghan prison. Julia’s mother is the uber-famous, Stephanie Gallo who also happens to be the most trusted adviser (and possibly more) to the newly elected President Robert Alden. While protecting the President, Secret Service Agent Elise Campbell overhears Gallo threaten the President’s job concerning the death of an ex-staffer if he does not help free Gallo’s daughter. Vicious…. Scot Harvath is now on his own and is called in to spring Khan and trade him for Dr. Gallo. With a $500,000 down payment and the promise of another $500,000 upon successful completion of this task, Harvath travels to Afghanistan, meets up with old colleagues, and embarks on his dangerous rescue mission…. To see how it all works out….you will just have to pick up or download “The Apostle”. 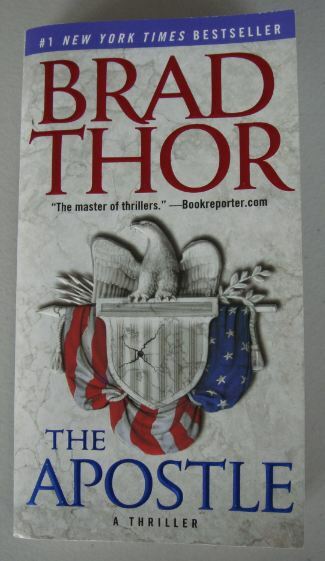 It has been awhile since I have read Brad Thor…so many books, so little time, but, I am always reminded how damn good a writer he is. His style is smooth, easy to read, yet descriptive. The reader is in Afghanistan and in battle…..